A 12 podcast series produced by ‘This American Life’ a syndicated American radio program and WBEZ Chicago, a community radio station. Part story telling, part investigative journalism, part amateur sleuthing in the style of Scooby Doo (as one reviewer put it), Serial tells the story of the 1999 murder of Baltimore high school student Hae Min Lee and the conviction, after two trials, of her former boyfriend Adnan Syed, who was given a life sentence. In each episode, journalist and broadcaster Sarah Koenig attempt to unravel a different element of the case to answer the question: Did Adnan do it? It’s the most downloaded podcast of all time with more than 5 million downloads as of January this year. The chatty, personal style that exploits the audio-only medium and draws you in. How much you learn about criminal investigation and procedure. The setting, Baltimore, one of America’s most interesting cities. 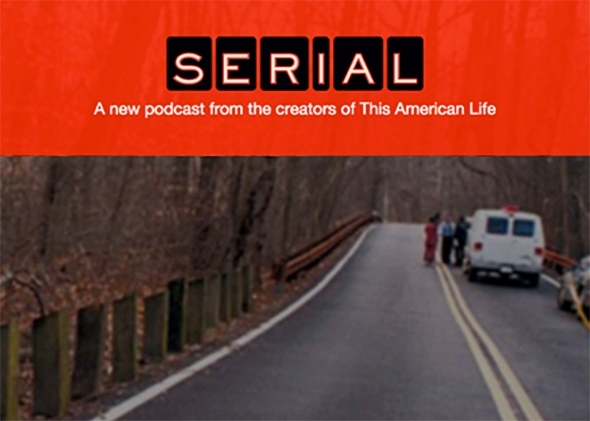 The interweaving of narrative, interviews, opinion and evidence that gives Serial its power. Trying to remember all the details and keep track of the various plotlines. At times confusing. The ending may disappoint some. Eight and a half hours of listening time, plus many more hours on the Serial website, doing your own research and reading analysis and comments about the show. It’s addictive. Can you recommend something similar, in another medium? The Oscar-nominated documentary: “Capturing the Friedmans” about dark secrets in a upper middle-class Jewish family in New Jersey. And watch The Wire, a television series set in Baltimore about criminals and the police that pursue them. Arguably the greatest television show ever made. 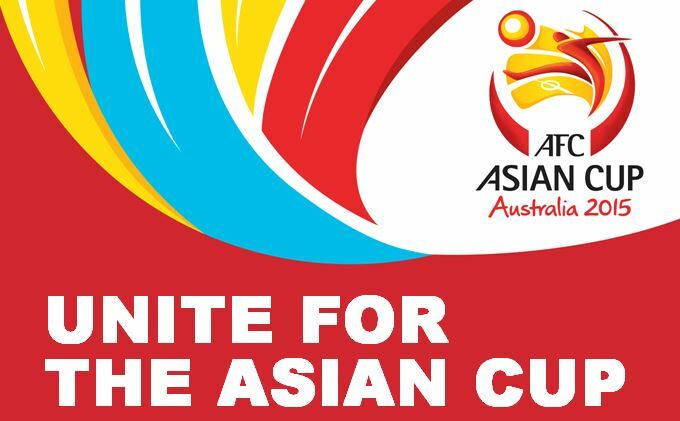 It struck me – with the force of a Tim Cahill wonder strike – that there was something decidedly wrong with the 2015 Asian Cup. North Korea. Iran. Saudi Arabia. All run by brutal dictatorial regimes, all with appalling human rights records, but allowed to compete in an international sporting event. Has the world gone mad? Have we lost our moral compass? I ask from the perspective of a South African who remembers our isolation from world sport, forced to live off a diet of local competitions and the occasional ‘rebel’ cricket or rugby side visit. Of course, it was quite right that we were banned, given our cruel apartheid policies, though there were some who argued that sport and politics should be kept separate and that we shouldn’t punish individuals, many of whom opposed the government’s policy of separation, from competing internationally. Certainly, there were many great South African sportsmen and women denied their opportunity on the world stage, barred from competing at Olympic and Commonwealth Games and from cricket, rugby and soccer world cups. We had a world-beating cricket team in 1970 (thrashing Australia 4-0 at home) before we were kicked out of world sport, champion rugby and soccer players, swimmers and athletes. But, I got a real shock when I saw North Korea arrive in Australia to take part in the tournament, a ridiculous charade, given they refused to give media conferences or engage with the public and thankfully were bundled out in the group stages. Clearly instructions came straight from mad dictator Kim Jong-un and his henchmen on how to behave in a foreign country, a rare treat for the lucky few who were able to travel outside of their home country. The rest stay home and starve. Iran’s another shocker. “The Islamic Republic of Iran is a jihadist theocracy that has dragged Iran into economic depression while executing, imprisoning and intimidating its domestic opponents” wrote the Sydney Morning Herald’s Paul Sheehan recently. Iran is more dangerous than the Islamic State, he added. Iran’s people are beaten, imprisoned, tortured…but its team is allowed to compete in the Asian Cup. Even the players over here play with fear in their hearts: during the tournament players were warned not to be photographed with young female fans. As for Saudi Arabia, being a Jew I wouldn’t be allowed into the country (not that I have any plans to visit). Saudi Arabia is by all reports a brutal, repressive place, with medieval laws. The penalty for homosexuality is death. The penalty for blasphemy is death. Commit adultery and the punishment is to be stoned to death. Steal and you lose a hand. State your opinion in a blog and you get flogged. So, I ask again, has the world lost its moral compass? Do we now turn a blind eye now to every human rights violation in the name of sport and entertainment? Or have we finally decided that sport and politics should not mix. If so, a lot of South African sportsmen and women deserve an apology. He order a quarter pounder with cheese meal. Doesn’t she just mean ‘super size’? he wonders to himself. Sensibly, he declines the upgrade. 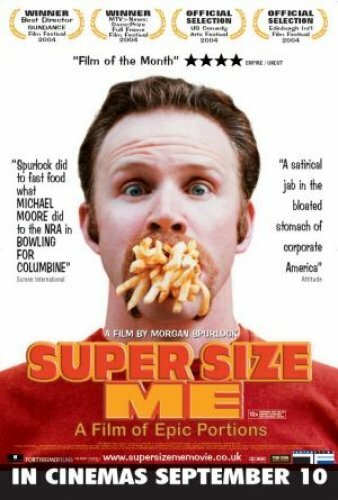 It’s just over 10 years since Morgan Spurlock made Super Size Me (the film was released in September 2004), a low-budget documentary about the fast food industry, where he nearly killed himself eating a McDonald’s meal three times a day for a month, and where he forced himself to ‘super-size’ his meal whenever it was offered. 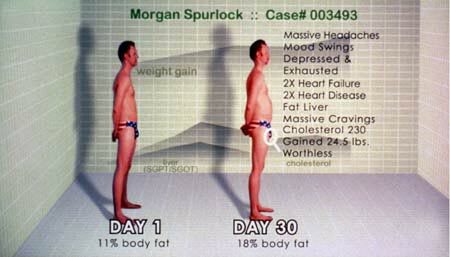 I watched Super Size Me for the first time recently (it aired late one night) and thought it a very engaging, thought-provoking and entertaining film, if you can stomach watching a young bloke quickly push his previously fit and healthy body toward’s ruination to prove a point about the evils of the fast food industry. The film was made for just $65,000 and grossed almost $12 million. Made two year’s after Michael Moore’s groundbreaking Bowling for Columbine, it cemented documentary film-making as a mainstream film genre, earned an Academy Award Nomination and dozens of other film prizes. Anyone who remembers the film will remember that famously gross scene, when Spurlock eats a double quarter-pounder supersize meal about the size of his car steering wheel and then, soon after, vomits it all up out the window of his car. Morgan Spurlock: My arms… I feel like I’ve got some McSweats goin’. My arms got the McTwitches going in here from all the sugar that’s going in my body right now. I’m feeling a little McCrazy. Over the course of the film Spurlock develops numerous medical conditions – high cholesterol, strange bodily sensations, depression and finally fast food addiction with his team of doctors and specialists flabbergasted at the decline of his health. Not only did Spurlock show how unhealthy McDonald’s food is – very high in fat, salt and sugar – but also how the fast food industry had gained control of America’s lucrative high school lunch menus and how it spends billions of marketing dollars every year to virtually brainwash young kids into consuming its products via its catchy advertising, bright colours and cheap meals. Morgan Spurlock: In 2001, on direct media advertising…McDonald’s spent US$1.4 bn worldwide…[By comparison] In its peak year the [US] Five-a-Day Vegetable Campaigns total advertising budget in all media was a lowly $2m. At the end of the film, and thankfully not dead, Spurlock declares a victory of sorts with McDonald’s announcing an end to its super size offer. Or has it? It was me who ordered that McDonalds meal. Was there anything really different in principle (yes the quantities may be a little smaller) between “going large” and super-sizing’? Over the years some things have changed. McDonald’s has introduced healthier menu items like salads, water and yoghurts, while in 2012 it started including kilojoule labelling in all its restaurants. But deep down, it’s the same philosophy driving the company: greasy burgers, made cheap, sold in their millions. Of course I am an adult and can make an educated choice, children are far more impressionable and McDonald’s is fighting harder than ever for it’s new generation of customers. McDonald’s also continues to sponsor local youth sports events including athletics, rugby league, union, AFL, soccer and netball. In Melbourne, my home town, McDonald’s has kept its restaurant contract with the government’s Royal Children’s Hospital and will also have a restaurant in the new Monash Hospital, when it opens in 2017. It also has the backing of the recently appointed Labor Victorian government with premier Daniel Andrews – a former health minister no less – defending the company from suggestions that its hospitals should perhaps consider a healthier food offering. Mr Andrews told people – including parents, doctors and nutritionists – to “get over themselves” and said McDonald’s at the children’s hospital was “here to stay”. McDonald’s will argue that it gives millions of dollars to sports programs, children’s charities and community events and that it creates jobs, which is true. But what it gets back is billions of dollars in revenue – the fast food giant has about 20 per cent of the $17 billion Australian market – and millions of new customers, many of whom are young and impressionable. This in a country with one of he highest rates of obesity in the world – double what it was 20 years – it seems we are losing far more than we are gaining. As for the end to McDonald’s super sizing, which Morgan Spurlock proclaimed a decade ago was a direct result of the popularity of his film, it seems a pretty hollow victory now. (Admission: the author does occasionally eat fast food, including McDonald’s. I usually wish I hadn’t). Every week freshlyworded.com scours the internet for five worthy reads and shares them with you, completely free of charge. The only criteria are that they be interesting/startling/enlightening (or preferably all three), that I have read them myself, that they are not behind a pay wall and that they can be enjoyed in the time it takes to drink a good cappuccino (sometimes quite slowly). – Finding ‘true love’ on Craiglist isn’t as easy as you think by Rosemary Counter (@RosemaryCounter). “The Bangkok Post dubbed Winyu Wongsurawat’s frenetic style ‘Jon Stewart on crack,'”. “When Mitte read the character summary for Walt Jr seven years ago, it came as a welcome shock. “The breakdown pretty much described me,” he says, still slightly amazed by his luck. “Dark hair, big eyebrows, cerebral palsy … I was like, ‘I have this covered.’”. If you have a worthy yarn, send a link to freshlyworded@gmail.com and I will review for possible inclusion. 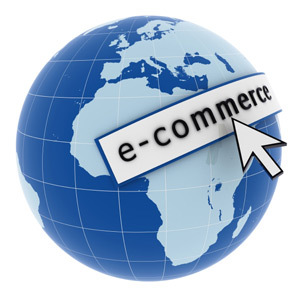 If you were asked to name the world’s ­fastest-growing e-commerce company behind Alibaba and Amazon, it’s a pretty sure bet that names like eBay and Japanese giant Rakuten would spring to mind. But the answer – as measured by ­year-on-year growth in monthly average desktop visits – is South African ­company Naspers. Few Australians would have heard of Naspers, or know of its roots as a publisher founded to provide a voice for nationalistic Afrikaners after the Boer War defeat. But it just might ­provide a ­perfect example of how a ­modern media company can adapt to the digital world. Before it began re-inventing itself as an internet, e-commerce and pay ­tel­evision business in the early 1990s, Naspers (short for Nasionale Pers, ­Afrikaans for “National Press”) was a strong supporter of white minority rule and cruel ­apartheid policies. Its first newspaper was Die Burger (The Citizen) and the paper’s first editor, Daniel François Malan, was a clergyman and ultra-conservative politician. In 1948, Malan led the National Party to victory over the more moderate United Party in white-only parliamentary elections, becoming prime minister. Later he would lay the framework for apartheid. These policies were supported by Naspers until the release of Nelson ­Mandela in 1990. But it was only in 1997 that Naspers sought to publicly sever its ties with the past (though you won’t find any mention of this in the history section of its website). That was also the year it appointed Koos Bekker, a graduate of Columbia University as chief executive. Bekker, who had pioneered pay ­TV in South Africa (now called DSTV), led the ­company into the digital age. In 2001, Naspers made its most sig­nificant ­investment when it paid just $US32 million ($39 million) for a 46 per cent stake in China’s Tencent ­Holdings, which was at the time the ­operator of unprofitable instant messaging ­platform QQ. 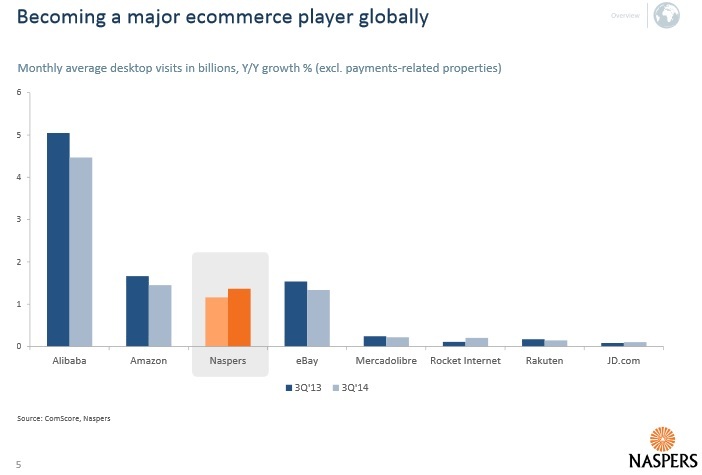 Today, Naspers has a market ­capitalisation of around $US66 billion, thanks mainly to its 34 per cent stake in Tencent, which has grown into a Hong Kong-listed mass media giant through mobile chatting applications like WeChat, which has more than 470 million subscribers. Off the back of this, Naspers has invested in dozens of other e-commerce and internet ventures targeted at ­emerging markets like India, Russia, ­eastern Europe and Latin America, with fast-growing populations and ­rising internet use. Naspers has a 29 per cent stake in ­Russian online portal mail.ru, and owns global online classifieds business OLX, which receives 11 billion monthly page views, and online payment system PayU. Of the $US6.5 billion in revenue Naspers raked in for the six months to September 2014, more than half came from its online investments and activities, with pay TV responsible for a third. The company still prints newspapers, although print accounted for just 10 per cent of total revenue. While the story of Naspers’ ­re-invention is the stuff of legend and the envy of struggling media companies the world over, questions have been asked of its role in policing China’s harsh online ­censorship regime on behalf of Tencent. China was recently ranked third worst country in the world for internet freedom by US independent watchdog Freedom House. Naspers chief executive Bob Van Dijk , who replaced Koos Bekker in February 2014 when he retired, has responded only by saying that Naspers complies with the laws of the countries in which it operates. None of this is likely to trouble Naspers’ biggest shareholder, the South African government – through the Public ­Investment Corporation – which recently inked a free trade agreement with China. As for Bekker, he elected to receive Naspers stock options rather draw a ­salary, leaving him with a $US2.5 billion fortune (the Naspers share price has risen more than fifty-fold since 2001). No wonder the expression “You never lose with Koos” has become popular in South African business circles. Driving through the green and rolling Natal Midlands and trying to find a roadside sculpture, we got lost and ended up in a small rural village. There were goats and chickens about and small brick houses that lined the bumpy country road. An African man was mowing the lawn outside his house in the overcast, misty morning. This image – of a black man mowing his own garden – struck me with some force. As a child I’d only known black men that mowed the lawn of white folks. We called them “garden boys” even though they were grown men. It was a small reminder of how much has changed in South Africa in the last 20 years and also a reminder of my sheltered, privileged upbringing in a white, Jewish home. We eventually found the right road and reached the ‘Capture Site’ marked by a poster with the words “Mandela” imprinted alongside photos of the great man depicting him during various stages of his life, from young tribesman to elderly world’s statesman. It was on this ordinary piece of road, three kilometres outside the town of Howick, on August 5, 1962 that Nelson Mandela, posing as a chauffeur for the impeccably dressed Cecil Williams, (a freedom fighter and theatre director), and on the run for 17 months, was finally captured by the apartheid police. For the next 27 years, following his trial and conviction, he would disappear from public view. The actual monument to this pivotal moment in the democratic struggle can be seen from the roadside, but not really seen at all. 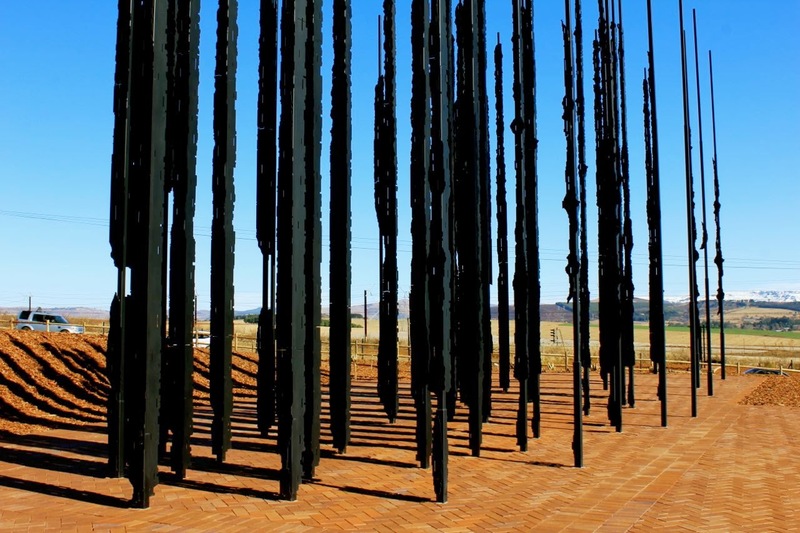 All you see is a seemingly abstract arrangement of 50 steel columns designed by South African artist Marco Cianfanelli. We park the car and walk down the red-brick walkway towards the steel columns, the rolling hills a backdrop. A car passes behind every now and then, a reminder of events 52 years ago. On that fateful day in August 1962, the Austin Westminster Mandela was driving was stopped and he was asked by the police if he was indeed Nelson Mandela. “I am David Motsamayi,” Mandela replied, using the alias he acquired on his travels to Morocco and Ethiopia. Later, after some questioning, Sergeant Vorster of the Pietermaritzburg police said:”Ag. You’re Nelson Mandela and this is Cecil Williams and you are under arrest! 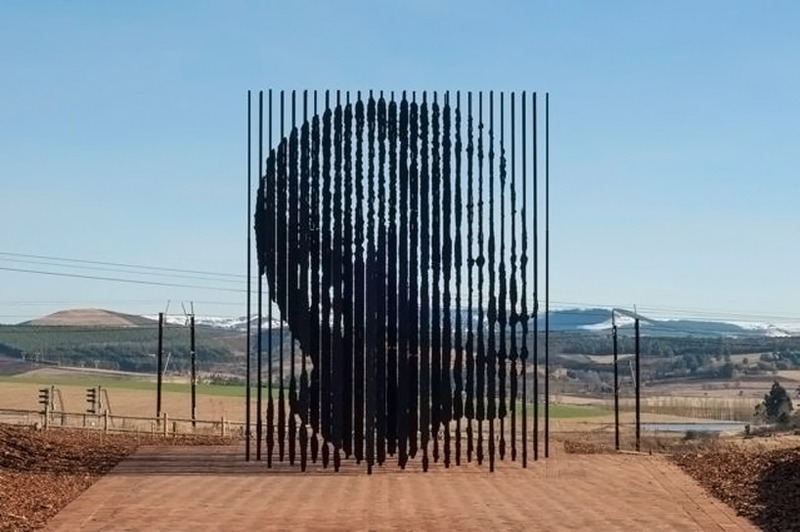 About 35 metres from the steel columns, an optical illusion occurs, the distinctive profile of an elderly Nelson Mandela emerges, looking out contemplatively towards the green hills. Behind him, you can see the spot where he was captured. It is a wonderful tribute to the moment of Mandela’s capture and its significance in the struggle to free the country from the shackles of apartheid. It’s one of many beautiful and powerful reminders: museums, monuments, institutions that have sprung up since 1994 to keep the story alive of the struggle, of what was sacrificed, what was painfully endured and why. 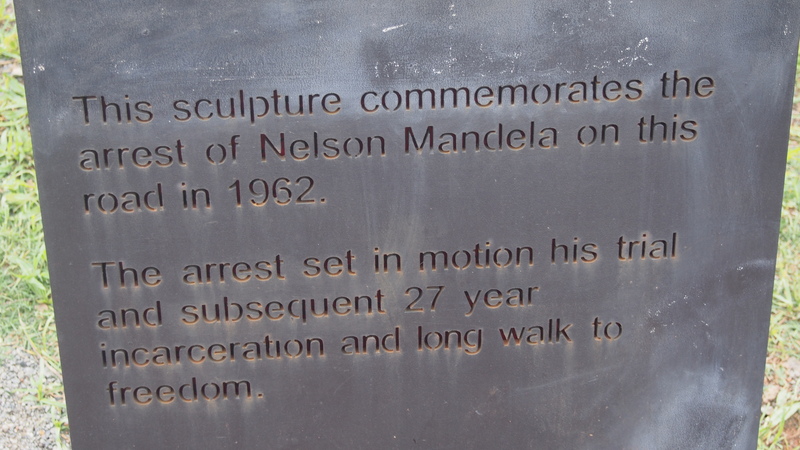 Having spent some time gazing at the face of Mandela, we returned to the car park and had lunch in the tea rooms. An old friend, who lives nearby, joined us for lunch. She told us that on the day Mandela died – just over a year ago on December 5, 2013 – she went with a young friend to place flowers at the monument. Many others who live nearby, had done the same. The visit to the Capture Site was one of the last things we did in South Africa. We flew back to Melbourne a few days later after a wonderful holiday. Of all the things we saw and did over almost four weeks – some inspiring, some depressing – the Capture Site memorial reminded me of the country’s incredible ability to tell stories, to make the past come alive for future generations and of its creativity and spirit. – Liliesleaf Farm in leafy Rivonia, the secret headquarters for the resistance movement in the 1960s.